MUSIC: tuning, scales, fractions, ratio, harmonics :MATH ! Part deux. This was the situation faced by J. S. Bach when he wanted to write music in any key. He figured that if two intervals had the same relative size then the two notes from the first, played together, would have the same musical “feel” as the two notes from the second interval. He wanted the major chord Bflat-D-F to sound like the major chord C-E-G, and so on. Not only that, but the scale devised so far is lacking four of the five “black” notes, and hitherto these had been fudged in. If one pursues the harmonic approach one finds that for example F-sharp and G-flat are different. See later for details. So he figured that as there were 12 semitones in the full octave the frequency of each note would have to be a fixed multiple of the previous note, so multiplying 1 by this fixed number 12 times must get you to 2. In other words the magic number is the twelfth root of 2. Its value is 1.059463094 from my calculator. The table below shows the comparison between the new Equal Temper scale and the harmonic scale. Part three will look at beat frequencies and reasons for preferring the harmonic system, though not for keyboard instruments. MUSIC: tuning, scales, fractions, ratio, harmonics :MATH ! Nobody knows when or how humans began to make music, but as soon as they could make things that could be used to play “nice” sounds (call them “notes”) they wanted to make musical instments, objects that could produce a number of different notes. The ocarina was an early one of these, and a strange collection of notes it makes. Eventually it was found that some sequences of notes of increasing pitch sounded “better” than others, and the result was a “scale”. The one I am considering here is the well known eight note scale, which runs from a start note to a finish note one octave higher. Found on a piano as the “white” notes, they are C D E F G A B and C’. As usual, it’s one thing knowing what you want, it’s often quite another to find a way of achieving it. In this case it is “string to the rescue”. A stretched string can be made to vibrate by plucking it. The result is a “nice” sound. This sound will have a “pitch”, which is musical jargon for the frequency of the vibrations, which is physics/engineering jargon for the rate at which the string repeats its vibrations. This rate is expressed in repeats or cycles per second (or other unit of time). Now it was observed millenia ago that if a finger is placed on a string halfway along and the string is then plucked the vibration rate or pitch is doubled, and the sound is described as one octave higher than from the unfingered string. This new note is also known as the first harmonic of the original. The second harmonic is what you get if the finger is placed one third of the way along the string, and its pitch is three times the original. The third harmonic, with pitch four times the original, two octaves up, comes from a quarter of the original string length, and so on ……. Taking the second harmonic, and halving the frequency, or pitch, we get a new note which is between the original and the first harmonic, and either of these played at the same time as the new note gives a “pleasant” sound. Doing this for the the fourth harmonic (one fifth of the original string length) we get another new note and the original plus the two new notes together produce what is known as the “major chord”. On the piano, with C the original note, the new notes described above are the G and the E.
Now we can do some math ! If the pitch of C is 256 then the (harmonic) pitch of G is 256 times 3/2. Why? Because the pitch of a harmonic from a plucked string is inversely proportional to the fraction of the string used to make the harmonic. There do seem to be some holes in this, when comparing with the piano. Where are D, F, A and B ? but F at 11/8 and A at 13/8 don’t look good. the B and the D in relation to the G.
We still have a problem with F and A, so let us try to set up F A C’ as a major triad by using some simple fraction manipulation. Observe that these frequency ratios determine the notes for the scales of C and F, and the scale of G without the F-sharp. More ratios of interest can be found, as we can see that the intervals CD, DE, FG, GA, AB are whole tones, and EF and BC’ are half or semitones. 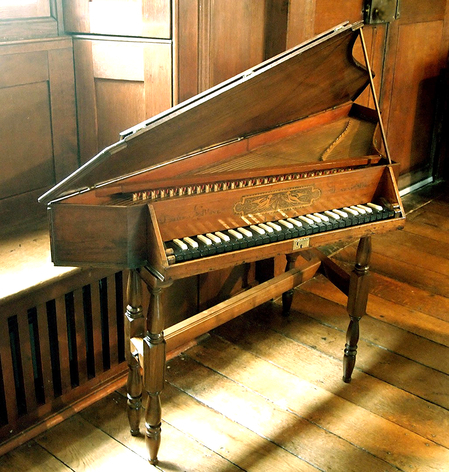 Up to the time when Johann Sebastian Bach intruduced the equal tempered scale together with a set of pieces written in each of the possible keys the methods of tuning keyboard instruments (harpsichord, clavichord, spinet) were based on some variant of the harmonic approach. Next post: The equal tempered scale and some more math.